A First for Me: A Book Review! I'm not generally a fan of surprises; I've planned my life around avoiding the unexpected. These past few days, I've had a pleasant surprise, which has me pondering whether my tendency to a closed mindset is something to tackle in the upcoming year. I've been dreading a huge impending burden, knowing that it should not be my burden, but that it eventually will be, so I gathered my courage and started accepting the truth. My in-laws moved into assisted living over a year ago. They did so reluctantly, and have yet to embrace the permanence of this move. They are currently in their third residence since, due to a combination of restlessness and some behavioral issues that are long-standing and probably fixed. Not "fixed" in the repaired way, but "fixed" in the permanent way. Left behind are two homes, both fully furnished, and one with a lifetime of memories, collections, and household items. The stacks of mail are still there, in their slit-opened envelopes. The magazines are still stacked, complete with the blown in subscription cards which seem to multiply in the dark. Who is going to deal with this? When? There are three grown sons, each with his own new family and full household. Each is a busy professional and none are happy with the seemingly sudden aging of their parents into a dependent state that is far more desperate than graceful. I know without reservation that the emptying of the primary home would not be a task embraced by any of these three sons. I know also that the one son who has the temperament to handle the giant project has used all his patience and forbearance on the day-to-day management of the needs of his parents. If the burden of this house is ever going to be lifted from the family shoulders, and if its value is ever to be contributed to the care and feeding of its former occupants, the process of doing so would fall to me. 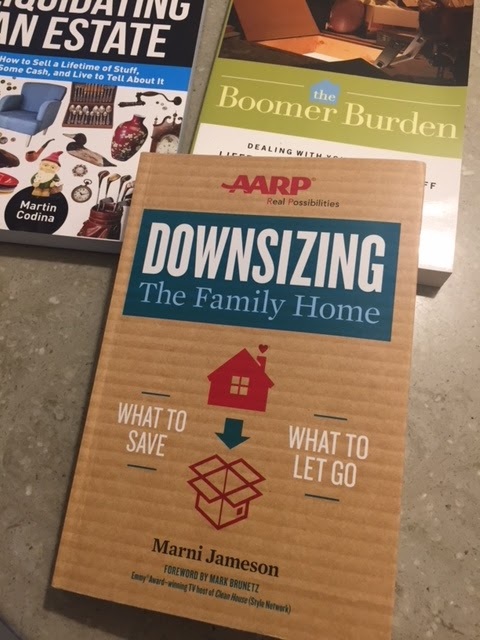 Fully aware of the irony inherent in purchasing three books on downsizing, I wasn't able to discern from the reviews and blurbs which was the one book to answer my need. I ordered all of them on amazon and did nothing other than post a photo of them to my instagram account inviting my acquaintances to enjoy the irony. I set the books aside, thinking I'd done enough for now. I brought the least daunting of the three books with me to a medical conference, knowing that the subject matter would seem less daunting in an environment of intense learning. I read the introduction and was stricken by not only how practical this book is, but how thoughtful and kind. 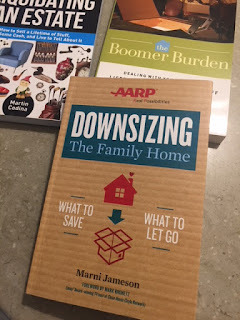 I expected practicality from a publication from the AARP, but never knew that the advice I'd find would be so respectfully and pleasantly presented. Liquidating a family's memories and treasures is never a happy task. I didn't think I'd get my husband and his brothers to consider reading on the subject, but I will enthusiastically offer to give them copies of this book. My hope is that we can tackle this project with love for one another and respect for the lives their parents have created. That this simple-appearing book offers solutions and advice to that end, is something that has surprised me in the best of ways!